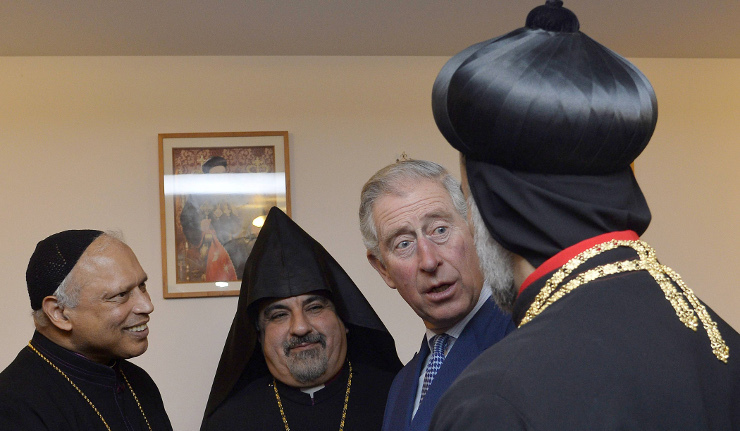 The prince, who earlier this week met with Prince Ghazi of Jordan, the chief adviser for religious and cultural affairs in his country, acknowledged that many Middle Eastern Christian communities had served to connect estranged Muslim groups. “This crucial role throughout Middle Eastern society is one recognized by many Muslims (who are not extremists) both Shia or Sunni, who attest to the fact that Christians are their friends and that their communities are needed,” he added. The population of Christians has declined across the birthplace of the religion in recent years as Christians in Iraq, Syria and Egypt have increasingly faced persecution. In Syria, Christian communities have found themselves both caught in the crossfire of the civil war and at times directly targeted by the rebel groups. After Egypt’s military overthrew Mohammed Morsi, the former president’s supporters blamed Egyptian Christians for his deposition and used it to violently and destructively lash out against the Coptic community. Although Christians there make up 10 percent of the population, since August, dozens of their churches and institutions have been burned or destroyed. In October, gunmen opened fire on a Coptic wedding party and killed four people. Additionally, Egyptian authorities have also been accused of standing by during the attacks and not confronting or prosecuting the Islamists terrorizing Copts. The prince said that the heightened violence and persecution against Christians in 2013 had to be a turning point in how the rest of the world responded.